Lilium formosanum is a native of Taiwan. The species name, formosanum, comes from the name Formosa – an earlier name for Taiwan. The plants can grow up to seven feet tall, but average height is four to five feet. They can bear one or two flowers per stem with some selections bearing up to 40 flowers per stem. Seed sown in January can flower the same year by September. Lilium formosanum ‘Ivory Trumpet’ is a smaller, hardier form of the much taller Taiwanese Lily. The taller 'type' species is sometimes considered weedy because it seeds about too readily and is tender. This shorter variety grows 30-45 cm tall and is more reliably hardy. 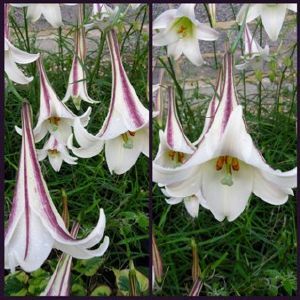 The large trumpet shaped flowers are richly coloured in purple/red on the back, pristine white within, and powerfully sweet scented. The plant prefers light (sandy) and medium (loamy) soils and requires well-drained soil. The plant prefers acid and neutral soils. It can grow in semi-shade (light woodland) or no shade. It prefers moist soil. Mulch well with composted manures or compost and shredded bark to keep the roots cool and add humus to the soil.